Marcel Proust (1871-1922) is the author of the sixteen-volume À la recherche du temps perdu (known in English as Remembrance of Things Past [1922-1931]). The first volume was published in 1913, and the last after the writer's death. These novels reveal not only Proust's expert knowledge of dress-he researched very precise details of garment construction-but also the way in which his appreciation of fashion has far wider implications, both within his work and beyond. When Jacques-Émile Blanche completed his portrait of the young writer Proust in 1892, he captured on canvas Proust's image of himself, which has become our own. Possibly, he was first thought of as a dandy, a socialite, and a darling of the duchesses-moving between the different worlds of fin-de-siècle Paris with infinite ease-and last as a novelist. He was, in fact, born to wealthy middle-class parents. His father, a Catholic, was a surgeon, and his Jewish mother was the daughter of a stockbroker. Proust's entrée into society and his literary career began when he was still a schoolboy. At the Lycée Condorcet (1891-1893), his friends included the children of literary and artistic families, who invited him into their world and their salons; he and his friends edited and published two literary magazines. 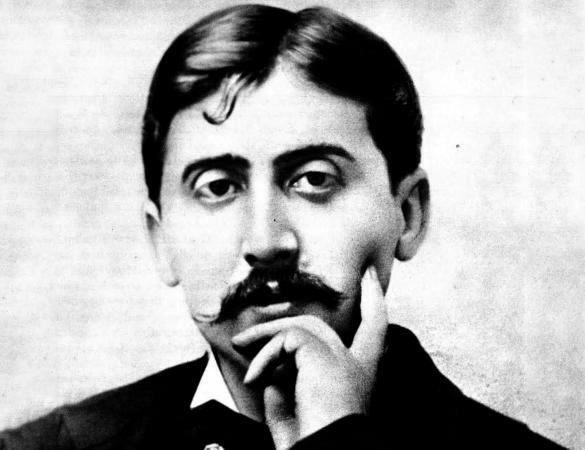 By 1906, when Proust began to devote all his energies to his masterwork-after his legal studies at the École libre des Sciences-Politiques, a prestigious school which formed part of the Sorbonne, and the publication of various juvenilia, pastiches, gossip columns, and translations-he was less inclined to haunt the salons. He had been keenly affected by the "Dreyfus affair": In 1897 a Jewish army officer, Captain Alfred Dreyfus, was accused and convicted of passing government secrets to the Germans and was sentenced to deportation to Devil's Island. The controversy played out over the course of a decade, until a court of appeals exonerated Dreyfus and he was pardoned. As a Jew and a man of conscience, Proust was active and passionate in his defense of Dreyfus, while most of his former grand hostesses sided with the government and army. The deaths of both Proust's parents soon afterward and the increasing problems caused by his ill health strengthened his belief that he was wasting his time. By 1913 his appearance had changed so radically that a young visitor to his flat, who glimpsed the Blanche portrait, did not recognize the slender young man pictured with a gray cravat and an orchid in his buttonhole. But that young man, who had gone to Cabourg, the "Balbec" of the novels, "armed with Liberty ties in all shades," as he wrote to a friend in 1894 (Painter, p. 174) had not entirely disappeared. The huge coat that Proust always wore in later years was lined with fur, and he was never without a hat, gloves, and a cane. 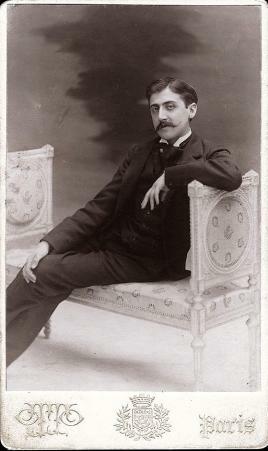 Proust's socializing began in the artistic salons of the late 1880s, but his desire to scale the heights of the Faubourg Saint-Germain-the wealthy and aristocratic section of Paris-to meet duchesses as well as the grandes cocottes ("great courtesans") of the Belle Epoque was strong and speedily gratified. The models for his later characters were found in these different settings. Baron de Charlus, for example, was based on Robert de Montesquieu, aristocrat and would-be poet, whom Proust first met in 1893. In the portrait of Montesquieu by the society painter Giovanni Boldini, the baron is raising his ebony cane like a rapier; the blue porcelain handle matches his large cuff links. His long-waisted jacket with wide lapels edged with broad ribbon and his white shirt with high, soft collar and dark cravat are part of the recognizable dress code of the fin-de-siècle dandy. His unusually high-coiffed hair, handlebar moustache, and small imperial-style beard, along with his arresting and extraordinary pose, created the kind of extreme image that Proust feared most, given its perceived links to homosexuality and to the writer Oscar Wilde, whom Proust had met and whose trial for homosexual conduct was thoroughly covered in the French press. Yet the young Proust himself was photographed with two close friends in a similar, though muted, mode of self-presentation. Elisabeth, Comtesse Greffulhe, one of the models for Duchesse de Guermantes, was a friend and cousin of Montesquieu. She posed for an unknown photographer at about the same time as Montesquieu sat for Boldini. She stands arranging flowers in a tall Greek vase, showing off the unusual back detailing of her dress, with its large white collar appliquéd with flowers and its pattern of light-colored flowers flowing down the dark dress, spreading out and underlining the shape of the skirt. Comtesse de Chevigné, another model for the duchess, wore cornflowers in her hat to emphasize her bright blue eyes, just like the Duchesse de Guermantes in the novel. She chose to be depicted, by another unknown photographer, in far more somber attire, as if to emphasize her intellectual credentials. This yoking of art and high society, which so fascinated Proust, caused André Gide, as a young publisher, to reject the first volume of the novel. In his later years Proust did not forgo the company of artists nor did he eschew high society completely. He became friendly with the writer Jean Cocteau and dined with the ballet producer Sergey Diaghilev and the dancer Vaslav Nijinsky, but his work took priority. We are told, toward the end of Swann's Way, that the young narrator is glad of his Charvet tie and patent boots as he waits for the former courtesan Odette de Crécy in the Bois de Boulogne. She is now married to the rich and respectable Charles Swann. Earlier in the volume she has been described as one of the most stylish women in Paris, with "rich garb such as no other woman wore." Her toilettes are always depicted in great detail, and the narrator is fascinated by the Japanese-style gowns that she wears at home. She has an inordinate number in different fabrics-silk, crepe de chine, chiffon-and the colors vary from old rose and mauve to Tiepolo pink and gold, all described carefully and frequently in Within a Budding Grove. An intense focus on sensuous detail is one way in which dress operates within the novel's sequence. Fashion is also vital as the way in which an individual constructs his or her personal identity while remaining mindful of the rules of social caste. Odette's outdoor clothes show small details in their trimmings or patterns, which hark back to her heyday as Second Empire courtesan. The craftsmanship and the overall design of her garments are stressed. The narrator follows Odette, enchanted, through the Bois de Boulogne, and Proust records the details of the linings of her jackets and the collars of her blouses, likening them to Gothic carvings. Such details may never be noticed by a casual observer but they are nevertheless vital. The woman to whom Proust awards the accolade of the very best-dressed woman in Paris is also one of the most socially elevated-Oriane, Duchesse de Guermantes, who is always spectacular and distinctive in her toilette. In The Guermantes Way, the narrator tells us of her appearance at the opera with a single egret feather in her hair and a white spangled dress, designed to make her companion and cousin, the Princess, seem over-dressed. It is she, as well as Odette, to whom the narrator turns in The Captive when he wants help with the selection of clothes for his mistress, Albertine. Indeed, it is Oriane's Fortuny gowns that Albertine is seen to covet. Male elegance, too, is described-particularly that of Swann, whose leather-lined hat, in Within a Budding Grove, the Duchess of Guermantes notes, just as Swann comments on the tiny coral balls frosted with diamonds that she wears in her hair at the soirée described toward the end of Swann's Way, likening them to rose hips dusted with ice. Dress, fabric, texture, and detail are seen as vital factors in the evocation of memory so germane to the novel. In the very last pages the narrator speaks of discerning the different threads woven together in a fabric of which he can now perceive the overall design. Although other writers have been fascinated by fashion, Proust is among the first to mention designers by name and to award them equal stature with painters and composers. Perhaps no author before him described an outfit, jewels, or accessories in such careful, minute detail. More significant, perhaps, is his roman-à-clef technique; celebrities are thinly disguised and their valorization permeates his work. In the twenty-first century's celebrity-dominated culture, this seems peculiarly pertinent. See also Art and Fashion; Canes and Walking Sticks; Dandyism; Fashion and Homosexuality; Liberty & Co.; Social Class and Clothing; Oscar Wilde. Adams, William Howard. A Proust Souvenir. New York: Vendome Press, 1984. Balsani, Leo. Marcel Proust: The Fictions of Life and Art. New York: Oxford University Press, 1965. Bowie, Malcolm. Proust among the Stars. New York: Columbia University Press, 1998. Carter, William C. Marcel Proust: A Life. New Haven, Conn.: Yale University Press, 2000. Painter, George D. Marcel Proust: A Biography. New York: Random House, 1989. Pringue, Gabriel-Louis. Trente ans de dîners en ville. Paris: Revue Adam, 1948. Steele, Valerie. Paris Fashion: A Cultural History. Rev. ed. New York: Berg, 1998. White, Edmund. Marcel Proust. London: Viking, 1999.